Live ball: A ball thrown by any player which has not come into contact with the ground, or any other object. Dead ball: A thrown ball becomes dead if it touches the floor. If a ball contacts the ball or roof of the player area it is still considered a live ball. A ball is also considered dead if it contacts a player departing from the field that has not committed a technical foul. Catch: A successful catch is made when a live ball that has been thrown by the opposition is caught. Out: A player is ‘out’ if they are hit by a live ball thrown by the opposition and do not catch it. A player is also ‘out’ if any member of the opposition catches a live ball thrown by that player. Block: A player may hold a ball and use it to ‘block’ balls thrown by the opposition and will not be called out if another ball hits the ball that they are holding. Headshot: If a player is struck in the head from an immobile position, and had no impact on their being struck in the head, that player is deemed to have been 'headshot', and may remain on the field of play, if they elect. Technical foul: If the referee declares a technical foul, the offending player must immediately exit the field of play, as well as a teammate within the closest proximity to the offending player. The proximity of the player is left to the judgement of the referee if there is any doubt in distance between players. Repeated foul: Any player that records three technical fouls in a row in one match without the other team recording a technical foul will sit out one (1) set of the match, and their team will play with one less than the maximum they can field at the time of the repeated foul. Major foul: If any team records two or more repeated fouls in one match, that team will be deducted one set point from the total score at the end of the match. If the team's recorded score is nil (0) then the score remains nil. Refrain from using foul or abusive language. If at any time a referee deems a play has not followed the Sportsmanlike Conduct they can issue a technical foul for the player. When a player is hit by a ball without the referee’s knowledge they will call themselves out and leave the field of play immediately. When a player is caught out by the opposition without the referee’s knowledge they will call themselves out and leave the field of play immediately. Eliminated players will themselves ensure that the first player eliminated is the first to return to the game in the event of a successful catch. 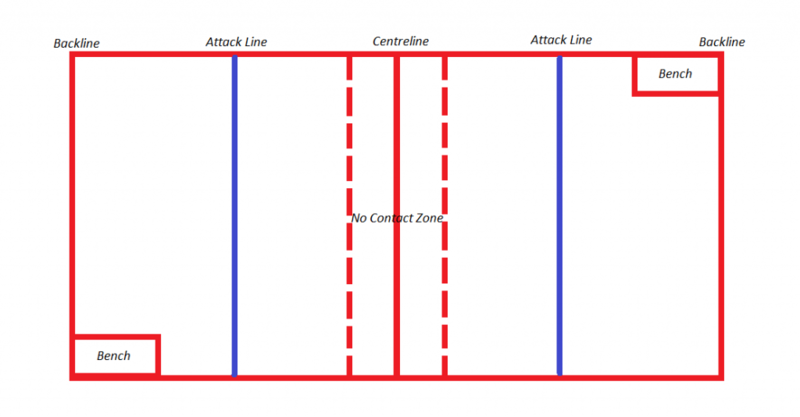 The dodgeball court will consist of a centreline down the middle of the court, and two attack lines running parallel either side of the centreline. There will be one rectangular ‘bench’ area in each half for eliminated players. The official ball used in league play will be a 7" diameter rubber-coated foam ball. All players must wear closed shoes, no exceptions. Participants must wear a top and shorts/pants without any sharp metal parts. No jewellery of any kind may be worn during play. This includes necklaces, bracelets, rings, earrings, etc. All games will be supervised by a referee; however rules are to be enforced primarily by the honour system (detailed above). The referee may change possession of any number of balls at any time they decide is necessary. The referee may warn players and call a technical foul on any player or team displaying unsportsmanlike conduct. N.B. The referee is not required to give a warning before calling a technical foul. Any form of abuse towards the referee by any player or spectator can warrant that person being removed from the venue. All players must sign a waiver form every season before playing their first game. The form outlines the league’s liability and sportsmanship policies. The form is available on our website. Any player that subs in, even for one game, must fill out a form prior to playing. The aim of dodgeball is to eliminate the opposing players from the game by hitting them with a live ball, or by catching live balls that have been thrown by the opposition. To start a game, each player must be touching their respective back net with at least one hand. 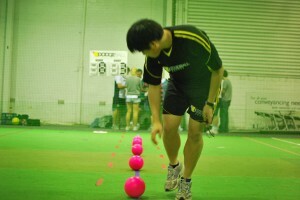 Six (6) dodgeballs are to be placed along the centreline. The referee will start the match by blowing a whistle, at which time players may rush to grab the balls. If any part of a player’s body touches the no-contact zone on the opening rush, that player is out. 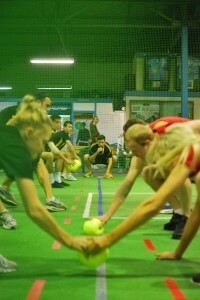 After all the balls have been collected, players can move all the way up to the centreline during general play. Players must retreat and cross the attack line before making their first throw, or can pass balls back to teammates positioned behind the attack line. If a player catches a live ball thrown by the opposition, then the player who threw the ball is out. Additionally, an eliminated member of the catcher’s team may return to the field of play. Players returning to the game must do so in the same order in which they were eliminated. Eliminated players must line up in order of elimination, starting at the rear end of the bench for ease of return to the game. When a player is ‘out’ they must raise their hand and leave the field of play immediately, without interfering with play in any way. Any player intentionally throwing a ball at an opposition player whose hand is raised will be ‘out’. Any player struck by an active ball without their hand raised while exiting the field of play will draw a technical foul. Players may pass the ball to team-mates if they are hit out. Players that do not pass balls to their teammates must put the ball on the ground directly at their feet. Any player that is exiting the field of play and does not pass the ball or place it at their feet will draw a technical foul. Any player who places any part of their body in contact with the ground on their opponents’ side of the court will be ‘out’. Players are not permitted to kick or step on the ball. Players must not lift or support their team-mates in catching, throwing, etc. Eliminated players must not interfere with or touch any balls while ‘out’. Doing so will result in a technical foul, with the second player removed from the match the teammate closest to the bench area. No team is allowed to have all six (6) balls on their half of the court for more than 10 seconds. If a team has all the balls they must make a legitimate effort to get at least one (1) of the balls across to the opponent’s half. The first violation of this rule will result in a stoppage of play and distribution of three (3) balls to each team. Play will continue with balls at feet. Any further violations will result in ejection of one player from the offending team. Each match will be 45 minutes long. A match consists of as many ‘sets’ that can be completed within the 45 minute match. No single set can exceed four (4) minutes. A set ends when all the players on a team have been eliminated, or when four (4) minutes have elapsed, in which case the team with the most players remaining wins the set. 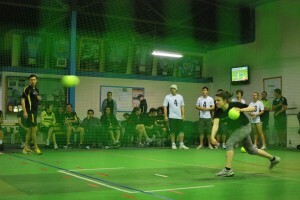 If at the end of four (4) minutes there are equal players remaining on each team, ‘sudden death dodgeball’ is played. In sudden death dodgeball, all eliminated players return to the field of play and the balls are returned to the middle of the court. The referee blows the whistle to start and the first team to eliminate an opposition player wins the game. Each set won is worth one (1) point. At the end of the match, the team with the most points wins the match. If both teams have won an equal number of sets in the match then it is a tie (except in finals where another set is played). If the referee blows the whistle to stop play, all balls will be considered dead immediately. All teams are expected to be at the venue 10 minutes before their scheduled match start. Matches will start right on the scheduled time. At match start, any team not meeting minimum player requirements (at least 4 players) will forfeit the match, at the referee’s discretion. If a team forfeits a match, they are required to pay the match fee before being allowed to play their next match. If a team forfeits more than twice in a season, their status in the league will be placed under review. If a team forfeits, the centre will make every effort to organise a ‘scratch match’ to be played for the other team. A forfeit is recorded as a 7-0 loss to the forfeiting team.